Stephanie’s on Newbury boasts that it serves “Sophisticated Comfort Food” in a “relaxed and inviting atmosphere.” This is basically restaurant code for we want to do good food but don’t expect you to wear a tie and we won’t kick you out if your heels aren’t at least four inches high. This is typically the kind of place I like to frequent when I’m looking for something interesting, but its a normal Tuesday. And it was, indeed, a normal Tuesday and my first night in Boston last week for the monster of a writing conference that is AWP. Since the conference is busy and overwhelming it was probably our first and only night to really take our time an enjoy the restaurant. So after a bit of sightseeing we stopped for a drink and I asked the bartender for a recommendation for a nearby restaurant that was great with seafood. She recommended Stephanie’s, and the reviews seemed to back it up. I made a quick reservation with Open Table, and an hour later we were seated. The restaurant was quite busy for a Tuesday, and it is tastefully decorated and romantically lit. I immediately found a nice bottle of white Rioja around $30, and ordered it, and settled in to examine their menu. For our first course we ordered the Steamed New England Mussels as an appetizer, which came out promptly and was served with a piece of garlic crostini for dipping in the excellent sauce. And the mussels were delightful. A perfect portion for two people, and the sauce was brilliant with garlic and delicate buttery wine. The crostini was delightful, a perfect crunchy bread for dipping in hat sauce. But when we said this tot he waiter he got a look of confusion, and nodded, then said, “Yeah, but the bread’s good right?” It was clear he didn’t know what “crostini” was. And since it is actually listed on the menu that seems a bit odd. Maybe I’m spoiled by living in the culinary capital of New Orleans, but I can’t imagine a chef in New Orleans allowing a waiter to serve a dish they couldn’t describe. And the rest of the meal, I have to say, was basically downhill from there. This was really the worst dish – there was little to no goat cheese, and the vegtables also seemed rather scarce I don’t think there was any squash present. But all of that wouldn’t have mattered if the salmon had been properly cooked, but since it was overdone the whole dish came across as messy and bland. I would not order that dish again, and had I only had that, I would not go to that restaurant again. And, indeed, when we mentioned it to the manager, he seemed surprised, but made no attempts or offers to correct the situation, which is again, in my opinion, a restaurant fail. Especially since salmon is a relatively basic dish. My scallops were excellent and perfectly prepared. They were velvety and delicious and so was the risotto, even if the risotto was a bit on the runny side. The beet chips were delightful. I would order this again, and this dish, along with the mussels, saved the meal, I think. For dessert we had the Sticky Bun Sundae. 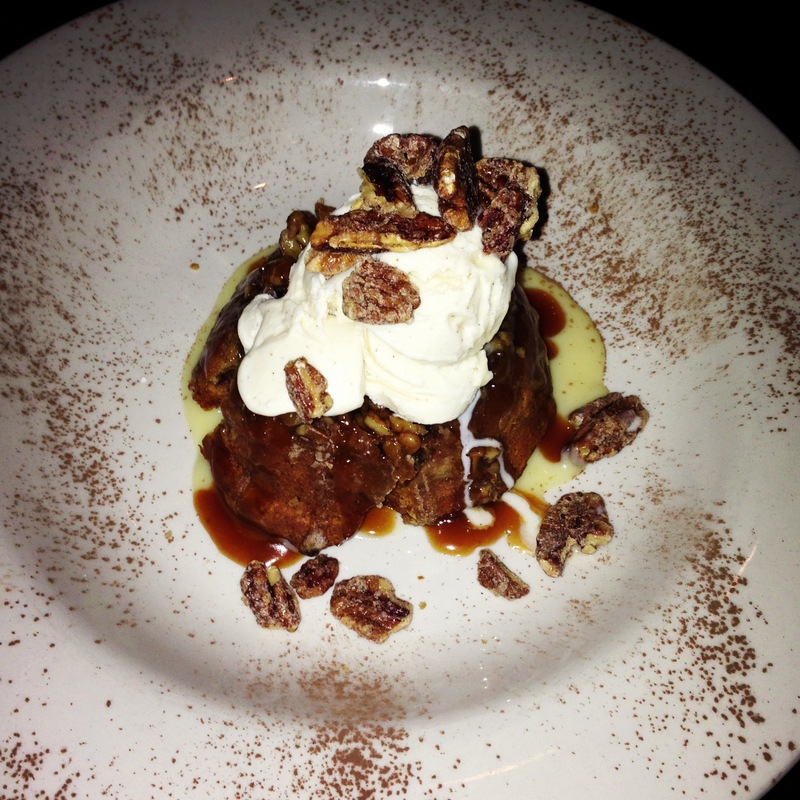 I don’t know if their desserts were prepared in house, but it was pretty much everything you’d expect from such a dish – sticky bun, ice cream, caramel sauce… Delightfully caloric, yet somehow a little dry tasting. It somehow lacked pizazz – I wouldn’t order that again either. If I were to return I’d opt for the Apple Tart Tatin or something a little more basic I think. As far as the service goes, while our waiter clearly appeared to be new, both to the menu and possibly to waiting at a fine dining establishment, he was gracious. 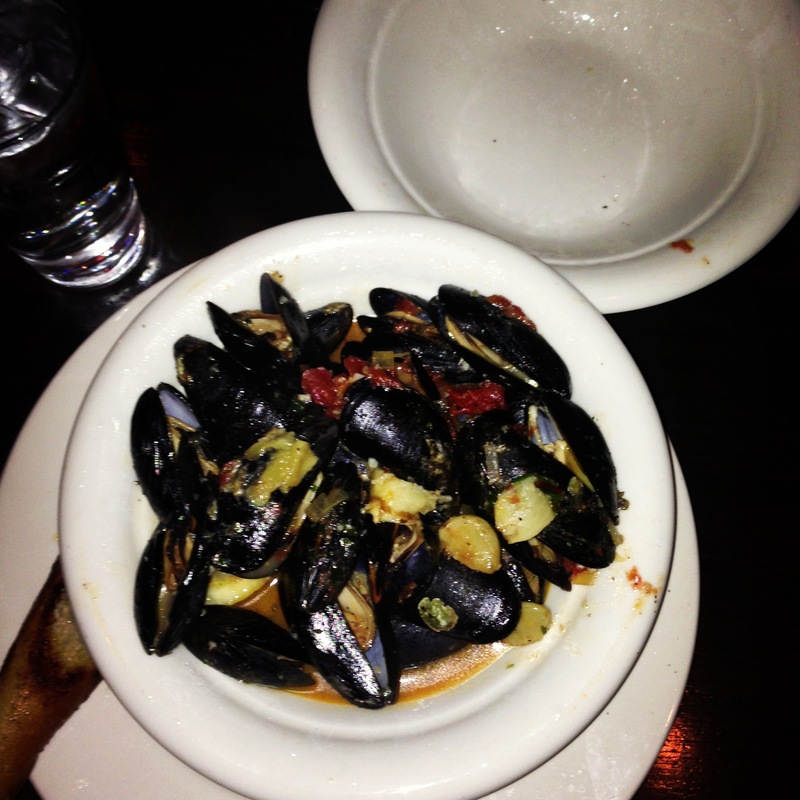 If anything I’d say were were a bit rushed, actually, as the entrees came out before we’d even finished the mussels. If there had been a long wait I could understand, but since there wasn’t this seemed yet another point at which the restaurant was slightly off. And thats my basic summation – some strong points, definitely, but very uneven, and the poorly prepared salmon makes me wonder if my scallops were the aberration or his salmon. I’d go again – but I’d be very careful about what I ordered. And I hope they do a little more education for their staff on the menu. However, we also ended up eating at Legal Sea Foods, a chain restaurant that began in the Boston area and grew out of a fish market. They focus on doing very fresh fish and relatively simple preparation. But – its clearly a chain. While operating around the same price point as Stephanie’s it was nowhere near as interesting, and the Legal Sea Foods mussels didn’t compare to Stephanie’s. So in that case I think their price point is a little high…. And the moral of the story, then, is that if you’re in Boston and hungry for sea food, give Stephanie’s a shot!